A ten-room apartment complex caught fire close to 12:00pm Thursday. 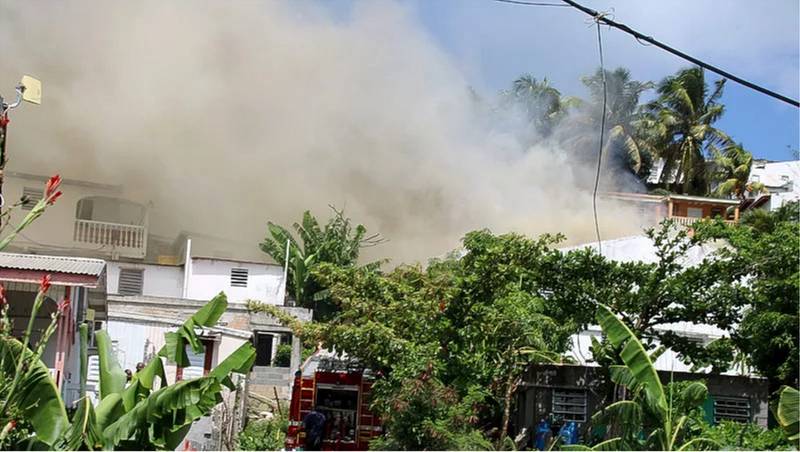 Fire-fighters rushed to the building located opposite Kooyman Mega Store where all persons in the building had to evacuate their homes. Tenants were seen running past firemen and police for their belongings, but the blaze grew and destroyed the interior of the building before documents and other essentials could be removed. Due to the thickness of the smoke and the flames, the Fire Department activated its “middle fire” procedure. Two fire trucks were at the scene. One of the tenants said electricity was the cause of the fire and by the time he noticed that his breaker box had caught on fire it already had spread to the outer part of the building. Getting the water supply to the densely built-up area was very challenging and as a result the fire was upgraded to a large fire. The Fire Department increased the water supply from the nearest hydrant to ensure sufficient water for extinguishing the fire. Due to the size of the fire and the large amount of flames, the decision was taken to tackle the fire from the outside, a strategy that would restrict its spread to other nearby buildings. Police closed A.J.C. Brouwer Road and traffic was diverted through alternate routes. Officer in charge Fireman Antonio Gibs said at the scene that they were doing everything possible to put out the fire. Head of Repression and Officer on Duty Nico van Zand had noticed a fire in the hills above Kooyman. No injuries were reported and police had cleared the area to allow fire-fighters the space to do their work. The fire was officially brought under control at 12:45pm.